There was grumbling back in 1994 when “The Fugitive” got an Oscar nomination for Best Picture. It was a fiercely competitive year—the film's rivals included “In the Name of the Father,” “Remains of the Day,” “The Piano” and the ultimate winner, “Schindler’s List”—and it was widely assumed that “The Fugitive” had been been granted the token “popular” Best Picture slot as a sop to regular folks who preferred escapism to heavy historical drama. It was a thriller based on a beloved but not particularly deep TV series, it starred action-adventure king Harrison Ford, and it wasn’t making statements about anything. I watched "The Fugitive' again last night for the first time in years and it didn’t seem like the weak link at all. It's as finely crafted an example of its specific subgenre—“wronged man tries to clear his name”—as you’re going to find. It’s as much sheer fun as “Casablanca,” “All About Eve,” “The Sting,” “Annie Hall” and “Rocky,” all of which won Best Picture over more superficially “serious” competition by embodying excellence without seeming to flaunt it. It glides across the screen like a falcon waiting for the right moment to dive. To be precise, this section is actually an exceptionally long pre-credits sequence, ending with Richard being pronounced guilty of killing his wife, then loaded onto the bus that’s supposed to take him to prison. (Notice how the film gives us a flash-cut of a cell door clanging shut right after the judge reads the verdict—a flourish that Sergei Eisenstein, the founder of montage editing, would’ve been proud to hang his name on.) There’s enough information in this prologue to fill up a whole other movie, but “The Fugitive” skips through it, shifting back and forth in time as needed, building you up to that astonishing moment when Richard looks through the side window of the wrecked bus and sees the light of an oncoming freight train. The hero dives free of the bus right before the train slams into it, then runs away from a derailed length of boxcars in high-speed baby-steps because his legs are still in manacles. 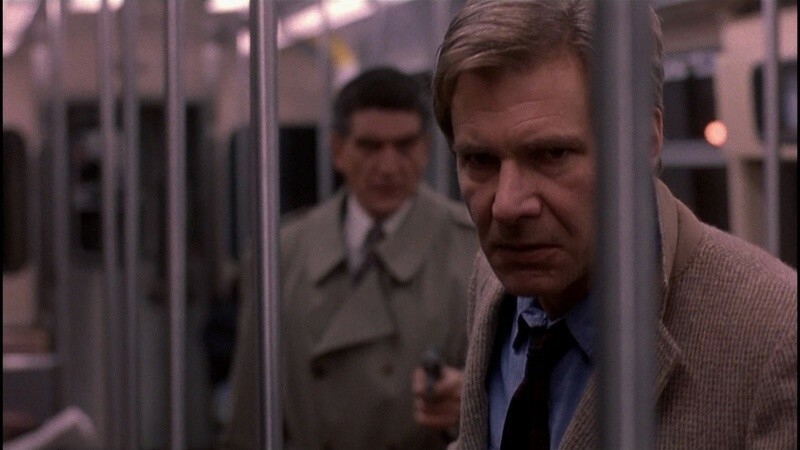 If there were any doubt that “The Fugitive” is an example of what my grandfather called “A one damn thing after another movie,” the sight of Harrison Ford trudging as fast as he can seals it. It's primordial. You could strip the sound and color out and add intertitles and its visual grammar would be indistinguishable from that of a silent movie produced in the 1920s, the kind where villains tied maidens to railroad tracks. The train crash itself is one of the great action sequences of the nineties, but for my money there are four others that are nearly as good: Kimble eluding Sam Gerard (Tommy Lee Jones) in the sewer tunnels a la Jean Valjean in Les Miserables (the inspiration for Roy Huggins’ original TV series); the raid on the house the results in the death of Richard's fellow escaped prisoner (Eddie Bo Smith, Jr.); Richard's escape from the Marshals on St. Patrick's Day; and Richard's fight on the train with Sykes, a great reminder in this age of wildly overscaled action that all you need to get the audience's pulses pounding is a good guy and a bad guy whose motives are clear. Davis and the film’s screenwriters, Jeb Stuart and David Twohy (look them both up; they’re two of the best action film scripters alive) find myriad other ways to deliver exposition without it seeming like that’s what they’re doing. One is their extensive use of Gerard and company. It's not hard to imagine an alternate universe cut of "The Fugitive" where the Inspector Javert equivalent is given a few scenes here and there while the bulk of the film keeps us in the shoes of its Valjean, Richard Kimble; but the screen time granted to the Marshals makes the film vastly more entertaining (Jones and the gang, Joe Pantoliano especially, are a hoot). It also gives Davis and his writers a built-in way to add new facts to the story and clarify points of confusion, simply by having the marshals banter. Another method of stealth exposition involves what Roger Ebert called “the gradually expanding flashback,” where you see disconnected bits of a past-tense moment, then a bit more of that moment later in the film, until finally you get a nice, fat chunk of it and learn the real reason they showed it to you in the first place. “The Fugitive” cheats a bit here, in that the mystery that cost Helen Kimble her life turns out to be something we never could have pieced together on our own. The salient details of the artery-unclogging drug Provasic, the switched samples, and the doctors’ ties to Devlin-McGregor Pharmaceuticals don’t start to emerge until the final third of the film, and of course they're an excuse to put Richard in jeopardy and keep him running. This is one of Ford’s very best performances. It was undervalued at the time, perhaps because it just seemed like the sort of role that was perfect for Harrison Ford (and it surely is that). But when you look at how much emotional as well as plot information Ford communicates through body language and facial expressions, usually without interacting with any other character onscreen (most of the time Richard is trying not to be noticed), you appreciate the degree of difficulty involved. This is the movie that finally won Jones an Oscar (as best supporting actor), and he earned it by being the coolest, funniest character actor onscreen in a year that also featured John Malkovich’s bizarre and terrifying backup work in “In the Line of Fire." But as charming as Jones is when he’s shooting the breeze with the other U.S. Marshals (Thomas Mills Wood, the ponytailed guy who loses hearing in one ear thanks to Gerard’s gunshot, might be my favorite), and as deadpan-tough as he is during moments like the confrontation between Gerard and Kimble in the tunnel (“I didn’t kill my wife.” “I don’t care!”), it’s Ford who gives the film its haunted soul. Davis gives "The Fugitive" its nervous heartbeat and hurtling momentum. This is not just the best Chicago action movie of the many that this Chicago native has directed (“The Package,” starring Jones and Gene Hackman, is a close second); it’s the culmination of everything Davis had learned about filmmaking up to that point in his career. The multilayered, at times prismatic way that it delivers information feels like an evolutionary leap forward for thrillers, although nobody identified it as such back in ’93. It’s constantly looking forward and backward even as it takes in the big picture, along with seemingly marginal details that turn out to matter a great deal. How many times have I seen this movie? Aside from the ten back in 1993, there have probably been another ten at-home viewings scattered through the decades. But I still keep noticing new things each time—bits that probably seemed like throwaways, or that barely registered, on first or fifth or tenth viewing, but that in retrospect make what might have otherwise been a contrived or absurd moment seem believable. Think about Richard pocketing the old man’s applesauce in the hospital room, and Gerard and his crew getting lost in the sewer tunnels after Richard Peter-Pans off the dam, and Dr. Nichols’ Freudian slip when Richard advances on him at the end (describing the partnership between the drug company and the hospital, Nichols uses the adjective “dishonest” but then immediately corrects himself to “honest”). The people who made this movie cared enough to load every frame with so much information that it would take fifty viewings to notice it all, but not a single bit of it jumps up in your face and says, "Notice me, aren't I clever?"